We have a rare chill in the air today so I wanted to talk about sweaters, specifically men’s sweaters. I feel like this is one of those things that most men stay away from but when done right, it looks extremely stylish and can really amp up a man’s winter wardrobe. All three of the above options are a definite yes in my book! The key to pulling off a stylist men’s sweater is fit though. You don’t want to go too over-sized or you might as well just throw on a big hoodie and call it a day. If you are going for a stylish upgrade, it has to fit well! The things I do not like in this look is the overboard silly patterns. The example with the fox and tree stripe pattern is a definite NO in my book. Woodland animals should not be on a men’s sweater. The only exception to this is if you are attending an ugly Christmas sweater party! You should stick with classic patterns such as the example in the top three photos. Another important thing to remember is this look is that the pants you pair with your sweater matter. If you are going with slacks that is fairly easy to do but if you choose jeans for a more casual look, you want the right jean. This does depend on the sweater though so there is no overall rule. Just make sure if you choose a lighter sweater color that you may want to go with a dark jean and vice versa. You can see in the examples at the top that the cream sweater is with a darker fade denim but the one with the pattern that has a dark base is paired with a slightly lighter jean. Men, what are your favorite sweater looks? Or do hate them? Let me know! I am just going to come right out and say it, I do not like velvet. To be quite honest, I couldn’t even think of one instance where I would wear it, in any piece of clothing. This puts me on the no side of the debate this week because according to several fashion experts, velvet is a definite must have item this season. While searching for the hottest examples of this trending fabric I did see a few looks that I was not completely against. Although in reality, I think it is one of those things that I may stop and look at it but will more than likely not even take it to the dressing room and will end up walking away without even removing it from the rack for a better look. However, I will share with you photos of the two velvet items that caught my eye while searching because I do think they are feminine and pretty and the patterns are perfection! Of course it doesn’t stop at shawls and shoes. We have velvet pants, velvet skirts, velvet dresses, velvet chokers, velvet tank tops, velvet button downs, velvet jumpers, and it keeps going on and on! I am interested to see how many of you disagree with me on this one. I don’t feel like I have seen this trend out and about much yet but in reality it is staying in the high 70s and low 80s in this part of Florida so velvet may take a little longer to make it’s debut here. This week we are veering off the “fashion” path again to talk about Fall & Winter Makeup trends. We all know eye shadows and lip colors get darker this time of the year but we are going to go beyond that today. One of the biggest trends in Fall & Winter makeup this year is the cat eye. While this look is not new, it did seem to die off for a bit but the cat eye was a popular look this season on the runway. Mix that with another big look for the season, metallic shadows, and your makeup will be spot on for the hottest trends of the season. There is an interesting twist to these two dramatic makeup trends though, we are seeing a lot of the big names go for a more fresh faced approach by avoiding heavy blush or bronzer. This idea keeps the focus on the dramatic eyes and tones down the rest of the face. Makeup experts suggest using a light coverage foundation and powder and if you feel the need to use blush, keep it in neutral tones and use a light hand when applying. The fashionistas of our society aren’t taking away our dark lip colors, but using a matte finish lipstick is going to be the best fit to complete this look. Are you seeing any other makeup looks that you think better fit our Fall & Winter season? Share them with us! This week we are veering away from fashion a bit and talking about hair. We usually see a big shift in hair trends when it comes to changing up your look from Summer to Fall but each year it seems there is a specific shade that we see everywhere! This year, one of the biggest Fall hair trends is copper. There are many variations on this hair color trend. The boldest version is full copper. This look is dramatic and fierce and definitely eye catching. It is also a fun way to get out of the “brunette or blonde” box that we seem to always try to fit ourselves in to. I am a big believer in red, all shades of it and this copper red is one of my favorite looks. 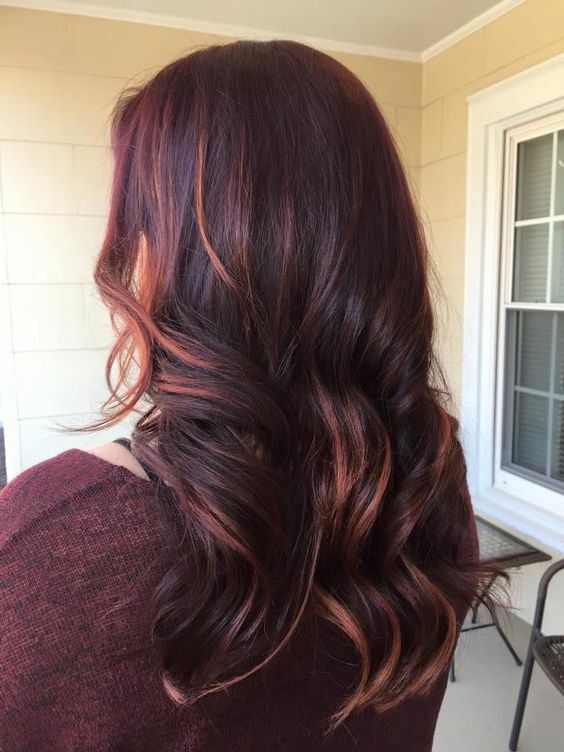 Although, I have more of a vibrant burgundy red ombre, not copper but I would still say this copper red is something I would love to try one day. The second copper option is copper color melt. The color melt trend shows no signs of going away at this point and this look fits right in with that trend while still experimenting with this fun unique color. 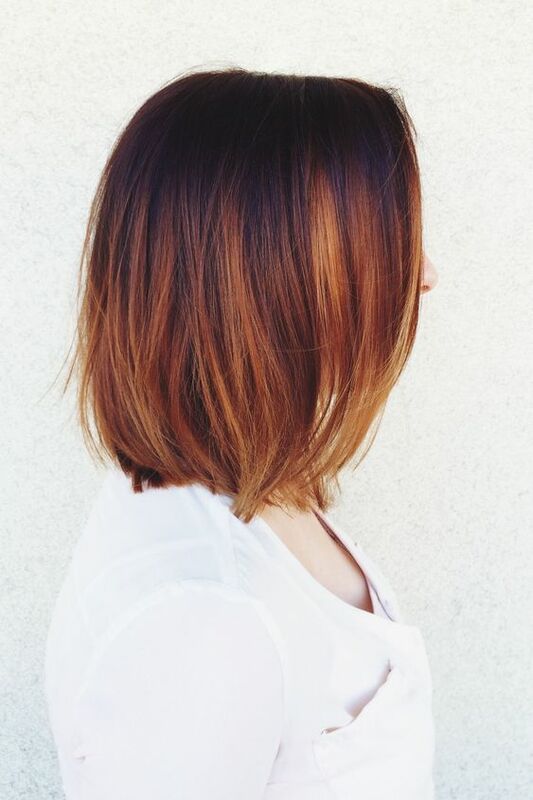 The best way to do this look is with ultra dark brown roots that blend in to lighter copper shades throughout and the ends of the hair are completely copper. You can also do this same look with a more dramatic root by using a dark burgundy instead of pure brown. Doing this creates a bit of a wild vibrant look that is sure to turn heads and draw attention. The more timid version of this look is a simple copper highlight. This can be done with blonde or brown hair. Copper highlights create dimension. 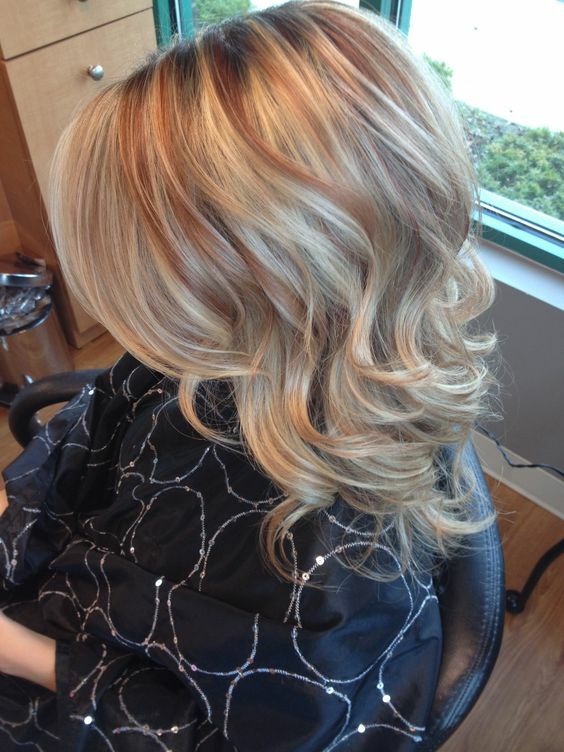 These highlights look particularly good with curled hair because it extenuates the curls. 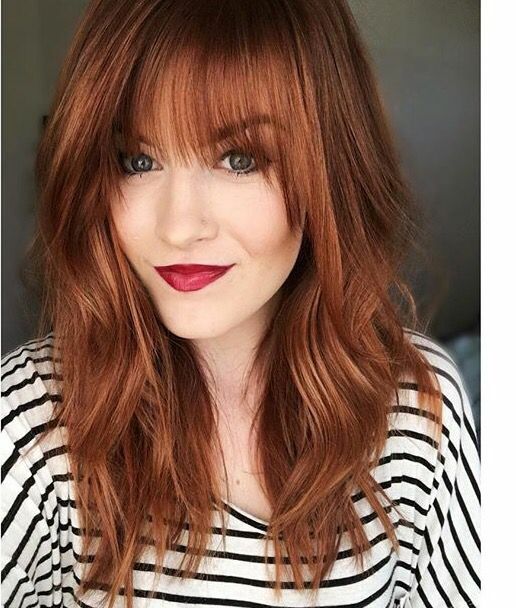 Do you have a different Fall hair color that you love? Share with us! 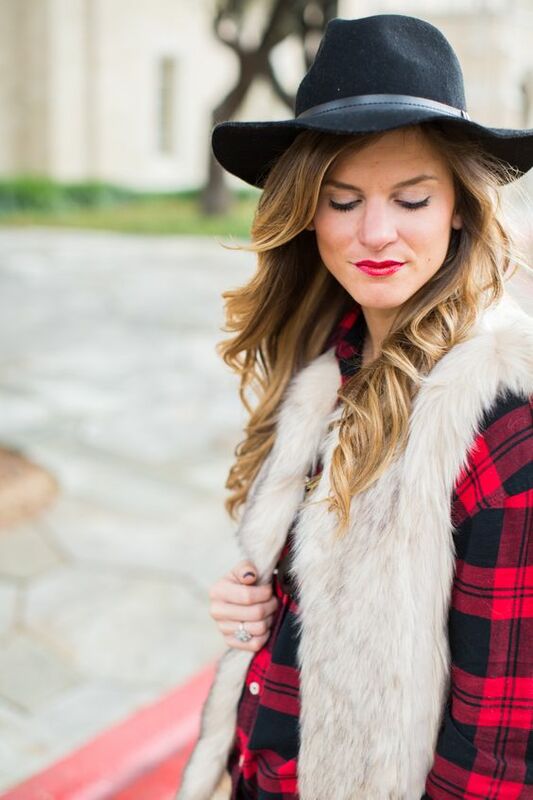 We would love to see photos of your favorite Fall looks!